at the most competitive pricing. An Environment Built for Speed and Resilience. We believe our new Velocity SSD VPS platform is the fastest of it’s type in Australia. We set out to build an environment that can deliver 10,000+ disk IOPS under random (non sequential) read/writes to each VPS. By comparison, a normal VPS might achieve 500 – 800 IOPS under the same conditions. When a server relies on a slow disk subsystem, it doesn’t matter how much CPU and Memory it has – it will be slow! Velocity SSD VPS eliminates this concern by ensuring that there will always be more than enough disk performance to meet any load requirements. 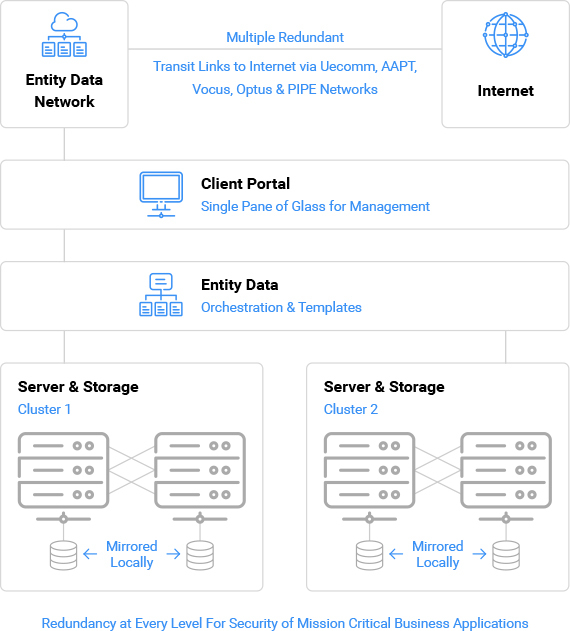 Entity Data has a reputation for reliability, having maintained 100% availability of our network over the past 8 years. Our all Cisco network is one of the largest in Australia (AS 56057) and we are multi-homed with some of the largest network carriers in the country, including Vocus, Nextgen, Optus and Megaport. What Makes Entity Data's Velocity SSD VPS Different? Velocity SSD VPS is built on enterprise grade hardware nodes offering exceptional performance and resilience. Performance is guaranteed, owing to an all SSD storage solution from DELL Equallogic. Automated provisioning allows you to get up and running within minutes, and a powerful control panel allows you to self-manage your server from the client area. You can upgrade to a higher package whenever you need. * Additional pre-paid data can be purchased during order process at $0.15c /GB (inc GST). With no single points of failure, our platform delivers exceptional reliability. High performance enterprise SSD storage delivering over 10,000+ IOPS. Upgrade/downgrade your VPS on the fly, whenever you need. The process is fully automated. CentOS, Ubuntu, Windows Server 2016, Windows Server 2012 R2, SQL Server 2016 & cPanel – more coming soon. Will my server be hosted in Australia? Yes, all Velocity SSD VPS instances are hosted in our world-class tier-2 data centre in Brisbane. For more information on our data centre facilities please click here. Can I order my VPS with cPanel? Yes, during the order process when choosing the VM template you can select ‘CentOS-7-x64-with-cPanel’. The pricing for cPanel is $19/month (Including GST). Does my VPS include backups? We offer scheduled R1Soft backups as an optional add-on. Various different backup and retention periods are offered during the order process, including Hourly Backups (CDP) and Daily Backups. Pricing for R1Soft backups starts at $30 /month (including GST). Can I upgrade or downgrade my Velocity SSD VPS? Yes, you can upgrade or downgrade your server at anytime. Our platform does not currently support disk space downgrades. Will my Velocity SSD VPS be managed by Entity Data? We provide basic management with our High Care Service Level Agreement (SLA). We do not provide management under the Standard SLA. Is support provided 24/7? How much does it cost? We provide 24/7/365 support at no additional cost. Only urgent priority tickets will be processed outside business hours.